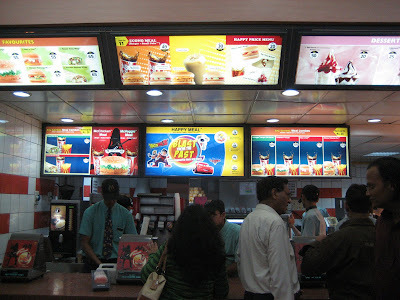 My hotel is located in the East Delhi Mall, and there is a McDonald's on the ground floor. I decided to try it for dinner tonight. If you are looking at the prices, 45 rupees equal 1 dollar US. I stared at the menu for about 10 minutes, trying to figure out what to get. Nothing really sounded all that appealing to me. 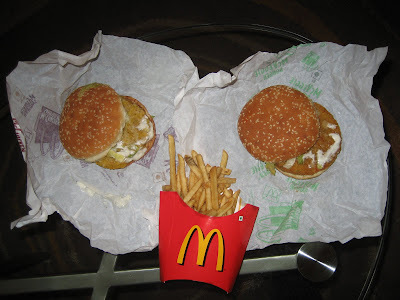 But I decided on a McVeggie, a McChicken and an order of fries. I ordered my meal to go and returned to my hotel room to eat. In clockwise order starting in the top-left, McVeggie, McChicken, fries. I was pleasantly surprised by the taste, especially of the McVeggie. It was a good Indian approximation of a McDonald's hamburger. The McChicken sandwich was also good. The only part of the meal that was awful were the fries, which tasted like regular McDonald's fries, but they had been sitting around for too long, making them soggy and cold.